Are you looking for the best charcoal and gas grill combo (hybrid grill)? When it comes to grilling, everybody wants to do it all year round. For this to happen, you will need to have a charcoal grill to enjoy your summer barbecue and a gas(propane) grill to use it in winter when it is cold and snowy. Charcoal grills are slow to heat up, hard to clean and require some skill but they are also cheap and bring out a smoky flavor that is compared to none. On the other hand, gas grills are expensive and lacks a good barbecue flavor but they are easy to start, fast and easy to clean. Fortunately, you don’t need to buy two separate grills because you can combine the best of both the charcoal and gas grill by using a charcoal and gas grill combo also known as a hybrid gas/charcoal grill. With this, you will have the convenience of a gas grill and the deep flavor of a charcoal grill. Getting the best charcoal or gas grill can be a hard task and it gets even harder when it comes to a hybrid grill (charcoal and gas grill combo). But there is no need to worry because the following is a list of the best charcoal and gas grill combo that will help you make a good choice. Follow the link to check out the latest pricing on these combo grills. Below is an in-depth review of these top rated charcoal-gas grills and why we picked them as our best combo grills. Here is the Number 1 best gas and charcoal combo grill and also the best selling combo grill across major online outlets. The Char-Griller 5050 Duo measures 60″ X 25″ X 50″ and has a cooking space of 1260 square inches. It uses 3 gas burners producing 40,800 BTUs of heat with electronic ignition plus a 12,000 BTU side burner. It is touted as the ideal grill for backyard and party grilling thanks to exceptional features like a heavy steel construction, porcelain coated cast iron crates that retain heat, plenty of storage space and a versatile charcoal system. It also has a double bottom construction, grate lifter, condiment basket and an easy dump ash pan. Both the charcoal and gas sides feature warming racks, an adjustable charcoal grate height and temperatures gauges for easy temperature control and perfect grilling. It not only offer the best of both charcoal and gas grill in one grill, but it does so perfectly. It is durable given that is made using a heavy steel construction. It is convenient with dual primary cooking surfaces, a large cooking space, a side burner for additional cooking capacity and warming racks. It has quality performance thanks to the porcelain coated cast iron grates that retain heat and are easy to clean. It is easy to use with built-in temperature gauge for easy control. The burners heat up fast to quite high temperatures. Besides, the grill maintains the temperature as long as you want. Want to know ho this combo gill compares to others and why we named it the best? 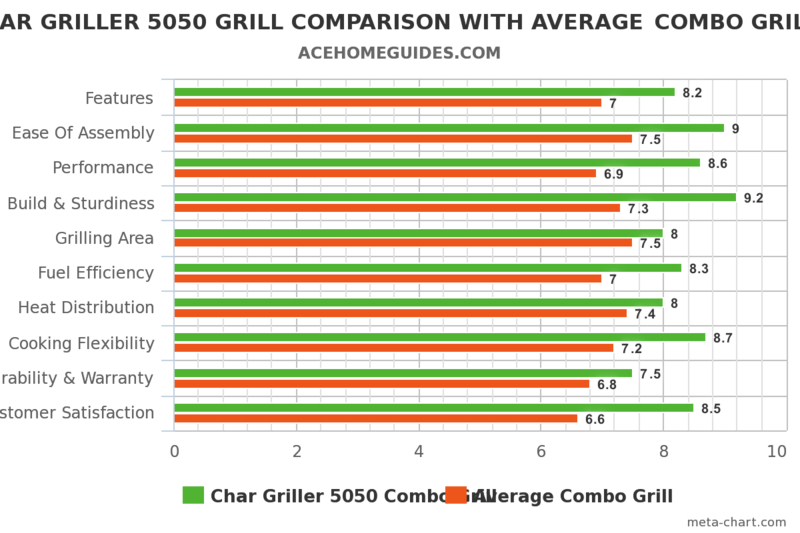 We looked at hundreds of reviews from leading online outlets to rate and compare the various top gas and charcoal combo grills and below is an analysis chart in which we compared this particular grill with average combo grills. Above that, this is the best charcoal and gas grill combo based on customer satisfaction. Note: The scale is from 1 to 10 where 10 represents the best of the factor analyzed. – There are people who may feel that the lid does not seal the cooking chamber well such that the heat and the smoke escapes. It isn’t too much though and wont definitely be a reason to to get this grill. Everything else is spot on and the experience is one that you are sure to love. It has a solid construction that ensures that is lasts longer and is efficient in distributing heat. It is convenient to use after a hard day’s work yet thrilling during those lazy weekends when you are with your family. The materials may not be the best but it is worth it given the price, convenience and performance. It is not the cheapest charcoal gas grill combo in the market, but one that you surely wont regret having in your backyard (worth every penny). The Char-Broil Charcoal Gas Hybrid is yet another superb combo grill from char-broil. With dimensions of 33.5 x 30.5 x 20 inches and weighs 87pounds, this grill offers just enough grilling area for most people. It uses 3 stainless steel gas burners with 30,000 BTUs that also ignites the charcoal component hence no need to use light fluids. Also included is a 12,000 BTU side burner which can be used to cook other dishes. It has a temperature gauge to allow you monitor how your meals are cooking getting them burnt. With the two wheels you can grill your meals anywhere in the house or yard without . The grill uses electronic ignition and boasts having a good sturdy design which comes in a beautiful black finish. The grill has features a fire box and a removable ash tray and a swig-a-way warming rack. It has a total cooking area of 545 square inches with 370 square inches being primary. – The burners are made of stainless steel material which makes the grill long lasting. – The gas burners ignite the charcoal and no need of using light fluids. This also makes charcoal grilling to start faster. – The three gas burners light up fast and attain quite high temperatures and the side burner is also a plus for convenience when cooking other dishes. – It is movable given its two wheels and you can always choose the best location for your grilling. – It comes with a temperature gauge so that you can monitor your meals well. – The cooking grates are porcelain coated hence durable and easy to clean. – It has a beautiful design and a smart black finish. Below is a summary analysis of this combo grill as compared to others on the market. This is based on detailed research from major outlets and our first hand research and findings. Perhaps the most complain that people have seen in this combo grill is the fact that although the tank is well concealed, it is only accessible from the back. This means that if you are cooking with the grill butted against something, you will have to turn it when need arises. Setting up and assembling the grill is also a somewhat lengthy process especially if you have little experience with this. Otherwise, it is a grill that you’ll be proud to have in you backyard. It’s got everything that you need in a charcoal/gas hybrid grill and you surely wont regret. From the burners to cooking grates, temperature gauge to ash tray and so on. It also has a good performance and solid construction and frankly, it’s worth every penny spent, and that’s why it enjoys an excellent customer satisfaction (based on reviews on major outlets). The Char-Broil Gas2Coal grill is a gas and charcoal grill that gives the best of both convenience and flavor that you need in a single grill. It measures 52.5 x 24.6 x 47.5 inches and weighs 115 pounds. It uses 3 main gas burners with 40,000 BTUs and a 12000 BTU side burner with lid which help to maximize cooking space when not in use. The best part of this grill is that it converts from gas to charcoal in one minute without employing any tools and this conversion simply happens by removing the grates and placing them on the side. Moreover, gas burners are used to light the charcoal and not the usual light fluids. The burners are made of stainless steel to ensure that they last long while the cooking grates are made of porcelain-coated cast iron for higher heat retention and easy cleaning. This hybrid grill has 420 square inch primary cooking area and 120 square inch warming rack which gives a total of 540 square inches of cooking area. It is a charcoal and gas combo grill which gives you the best of both sides in a single grill. It is highly convenient as it converts from gas to charcoal in less than 60 seconds. The cooking surface is fairly large and this is enhanced by the folding down and the lid of the side burner to create more space. It uses porcelain-coated cast iron grates which are durable, rust resistant and easy to clean. It has a well designed charcoal tray that ensures that there are less flare up during charcoal grilling. It caters for charcoal tray and propane tank storage which is highly convenient. It features electronic ignition and a lid-mounted temperature gauge for easy control during grilling. It has side shelves for an extra work and preparation space. It is durable and comes with a 5 year warranty. -You may find it a little hard to assemble. – There are those who may feel that the charcoal grill does not get hot enough. The heat produced by this combo gas grill tends to be lower in our experience. The Char-Broil Gas2Coal grill is has been described by many as the best grill ever. It is highly convenient and easily converts to allow the grilling of your choice. It may be hard build and takes some time to assemble but you will realize that it is worth the effort when you start using it. It is a highly recommended grill given the excellent performance and price. The Smoke Hollow 4-in-1 is a popular combo grill that is a perfect choice for a thrilling outdoor grilling and cooking experience. It weighs 218 pounds with dimensions of 82 X 23 X 54 inches. Being 4-in-1 means that you can conveniently use it as a liquid propane gas grill, charcoal grill, smoker and an infrared searing burner. All these units ensure that you get a perfect barbecue just as everyone wants it to be. The grill features heavier porcelain-coated cast iron cooking grids for the infrared side sear burner, gas grill, charcoal grill and warming rack in order to get the perfect grill for different types of food. It has 860 square inches of cooking area which is convenient for most grilling and four locking caster for portability. The gas grill comes with flare guards, removable grease trays and warming rack while the charcoal grill comes with height adjustable grates, adjustable air damper and built-in temperature gauge. It is highly versatile and you can switch between different cooking styles and adjust to different weather conditions thanks to the 4-in-1 combination. It has a generous amount of cooking space so that you can cook your food hassle-free. The locking caster make it easy to move and also very study when they are locked. The porcelain-coated cooking grates are durable, preserve the heat well and are easy to clean. It allows you to sear and smoke your food apart from grilling. You can use it all year round whereby you use the gas for your daily quick meals and charcoal when you have the time. It allows both propane and gas grill and you don’t need to spend money on buying extra separate units. It has built-in temperatures gauges for each unit for maximum control when cooking your food. The additional side burner is good for convenience when you want to boil water, warm your food or even cook the source. The only concern with the smoke Hollow 4-in-1 LP Gas Charcoal Smoker Searing BBQ Grill Model PS9900 is protecting it against weather elements which can make it to peel and rust easily. It may also take you some hours to assemble which is expected from such a solid built grill. In all honesty, this is an efficient and versatile grill that lives up to its promise of being the perfect grill for outdoor cooking and grilling. Its size is such that it does not take a lot of space yet performs many functions all at once. It is therefore a dream hybrid grill for any grilling enthusiast. This charcoal and gas grill combo is white in color with dimensions of 74.2 x 27.9 x 46.8 inches and weighs 140.7 lbs. It has 505 square inches of cooking area, 3 gas burners producing 36000 BTUs of heat with electronic ignition and a side burner with 12000 BTU. The charcoal side features a charcoal access door, crank adjustable-height grate and a slide-out ash pan for easy cleaning. The primary grates consist of porcelain-coated cast iron and wire swing-a-way. It also comes with a temperature gauge for easy control during grilling as well as rolling castor wheels so that you can move the grill to a spot of your choice. This grill is described as the ideal choice for grilling enthusiasts who enjoy the flavor of charcoal and the convenience of gas. This is a standard and affordable hybrid grill that gives you the best of both charcoal and gas grill. It uses porcelain-coated cast iron cooking grates as well as wire warming racks which makes them durable and easy to clean. The rolling castor wheels ensure that you easily move it around to a spot of your choice. It has dual temperature gauges to allow you monitor your cooking well. The charcoal grill is well designed with a crank adjustable height grate, charcoal access door and a slide-out ash pan for easy cleaning. The three gas burners light fast and produce enough heat of up to 36,000 BTUs. It has a beautiful design and does not occupy much space given its medium size. – It is prone to rust especially if it is left exposed to weather elements. – There are complains about poor packaging where others have been delivered damaged. This is one of the most affordable hybrid grills in the market yet it still has the features that other expensive models have. The construction may not be solid enough but it is still a good choice for the price and the fact that many users are happy with their purchase. The Dyna-Glo DGB730SNB-D Dual Fuel Grill is made using a commercial grade stainless steel to provide excellent performance and durability. The cooking grates are made of heavy duty porcelain enameled cast iron which is unparalleled in heat retention and locking in of food juices. This stainless steel/black colored dual fuel grill measures 28.67 x 45.63 x 68.45 inches and weighs 143 pounds. It offers a total cooking space of 952 square inches which is large enough for family cooking, parties and outdoor cooking and grilling. The gas grill features 2 stainless steel burners with a total of 24,000 BTUs, 2 enameled steel tents for even heat distribution and electronic pulse ignition that is controlled by two dials. The charcoal grill features a charcoal adjustment crank and a front access door for charcoal loading. Other features include stainless steel lift handle on the lids, temperature gauges, and collapsible side tables, warming rack, integrated towel bars, propane storage area and a removable ash pan. It is made using commercial-grade materials that are durable and have better performance by producing steady heat. The stainless steel heat tents distribute heat evenly, protect the burners and ensure a good natural food flavor. The heavy-duty cooking surface retains and transfers heat directly to the food hence they are ideal for searing and maintaining natural food juices. It is intuitive with easily accessible electronic ignition and control valves. It is easy to control temperature for both grills thanks to the charcoal adjustment crank and the temperature gauges. It has an ample preparation and working space given the side tables, tool hooks and towel bars. The table sides are also collapsible to create more space when the grill is not in use. It has a compact design that not only looks great but leaves minimal footprints for maximum cooking ability. – There are complains if it being delivered damaged or with missing parts. – It comes in two separate boxes and many confuse that with missing parts. The Dyna-Glo DGB730SNB-D Dual Fuel Grill is one of the heaviest and sturdiest combo grills in the market because it is made using quality materials to ensure excellent performance and durability. Many users have described it as a true gem whereby both grills perform reliably and it is not difficult to assemble. If you do not mind the weight, this is definitely a charcoal/gas combo grill worth trying. The Blackstone 3-in-1 Kabob is an affordable grill that offers a charcoal grill, smoker and kabob cooker. It offers a unique cooking experience with an option of an adjustable charcoal or mesquite bed for easy lowering and rising of hot charcoal. Also included are custom heavy-duty skewers to synchronize with the built-in motor for easy making of the shish kebab. With this grill, you can cook kabobs and grill at the same time in your backyard which makes it a must have outdoor cooking and grilling partner. The grill is coated with professional grade powder to withstand high temperatures and last longer. It has dimensions of 45.2 X 24 X 51 inches and weighs 95 pounds. It is a perfect backyard cooking unit with the ability to grill, smoke and cook kabobs. The heavy-duty skewers are exceptional unlike the bamboo skewers that burn easily. It has a built-in motor that automatically rotate the kabobs and this ensures that you consistently produce delicious kabobs. It is easy to clean because of the removable catch pan. It is versatile thanks to the adjustable air vents, coal bed, exhaust vent and also the temperature control. Despite the complaints of it being somewhat inefficient, many users still feel that it is sturdy and well made. It is a unique grill/kabob cooker that is a perfect upgrade in your backyard especially if you love the kabobs. Besides, it is big enough to cook for friends and family. The history of grilling can be traced to a hundred or so years and it is now the most popular method of cooking everything including vegetables. People nowadays do not have to wait for July Fourth, Labor Day & Memorial Day, Father’s Day or Mother’s Day to cooking outdoors and enjoy the flavor of food as well as entertain friends and family. Things have so far changed greatly as people continue to grill all year round with greater frequency not only during the evenings but also in the morning. 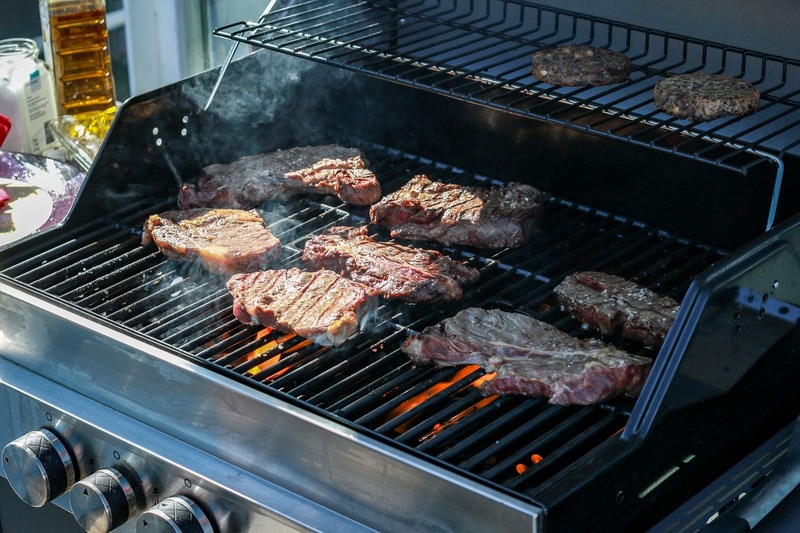 Gas grills may be the most popular due to the convenience factor but that should not disadvantage you in terms of getting a deep charcoal flavor. This is why you need a gas and charcoal grill combo that will give you the benefits of both gas and charcoal grill in a single product. Please also refer to our list of the best gas grills under 300 if you are specifically looking for an affordable gas grill. The number of combo gas grills out in the market today makes it quite a challenge to pick one. Good thing is there are many reliable gas grill reviews you can find online. The trick is to visit reputable gas grill review sites in order to gain information about the different brands, models and styles of gas grills to choose from. There are combo gas grills that are plain but can function right. There are also fancy combo gas grills with lots of accessories for people who prefer their grills decked with extras. In short, the sky’s the limit when it comes to gas grills. What’s more, you can even purchase your own grill online or you can visit an actual shop to see the product with your own eyes. What this means is, before you go and buy yourself a new combo grill, you have to arm yourself with the knowledge needed to select the one that can serve the purchase and that can meet your needs. Of course, you also have to think about how much you are willing to spend. No matter how many gas grill reviews you read, in the end you will still have to go back to how much cash you have at hand. In short, you should be prepared to shell out some extra cash if it means getting your hands on the best grill out there. So, putting price aside, what are the best gas and charcoal grill combo features that you have to focus on in grill reviews you come across? You need to decide whether you want a grill that runs on a refillable propane gas tank or one that runs on natural gas. Each type has its advantages so it is best to discuss them one by one. Regarding grills with refillable tanks, it is convenient because you will always have an extra tank ready just in case the one attached to the grill runs out of gas. Plus, you can move your grill from one location to another. On the other hand, a grill that is piped directly to natural gas line saves you from replacing the tanks regularly. However, you won’t be able to move your grill around as it has to stay fixed in one location. The best material to pick for your gas grill and stand, based on various gas grill reviews, is stainless steel. Stainless steel won’t rust and it won’t be damaged by food or grease sticking to it. It is also important for you to consider the grilling area when choosing a good combo grill. Even if you do not intend to do a lot of cooking on your grill regularly, you still need to find one with ample grilling area. Ideally, a grill measuring 75 to 100 square inches can accommodate burgers good for three to four people. The more food items you plan on grilling, the bigger your grate should be. However, some charcoal and gas combo grills do come with two individual cooking areas so that you won’t have to light the whole thing when you need to cook only a few items. Here is an expert video guide that can help you to find out which kind of grill you should be getting.